Notes: 1.125 in. bearing cap diameter, strap style yoke. 2.625 in. ring-to-ring width. Yukon Gear & Axle differential pinion yokes offer precise fit and strength for many applications. Their yokes are manufactured from cast steel, forged steel, billet steel, and aluminum—and are available for fitment on dozens of specific axle applications. Choose the high performance strength of Yukon Gear & Axle differential pinion yokes for your build. Does this item include bolts, straps and pinion nut? Thank you for your question. 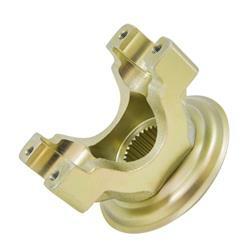 The Yukon Gear & Axle YY C3432487 pinion yoke includes just the yoke itself. The Yukon Gear & Axle strap kit is part number 41013. We also offer a Ratech 1501 pinion nut to complete the installation.